Two statistics stand out in Franz Klammer's extraordinary career to put his achievements into perspective: his extraordinary ten-race unbeaten run in downhills in 1974 and his sensational victory on the hair-raising downhill track at Innsbruck in 1976. Although the Austrian had a powerful build and great strength it was his technique that made him such a remarkable skier and which enabled him to win five World Cup downhill titles between 1975 and 1983. Observers say that he was unique among top athletes in being able to somehow "float" on his skis in perfect harmony with the snow conditions and vertiginous angles and corners of the track. His technique consisted of maintaining his skis flat on the track while using his powerful ankles and knees as shock absorbers, thereby achieving maximum speed. 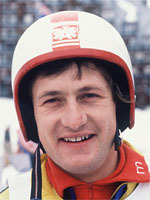 Despite securing a place in the hugely competitive Austrian team in 1970 Klammer had to wait until 1973 for his first downhill victory at Schladming. His greatest moment came at Innsbruck in 1976 in the Olympic downhill, considered by many as the most technically brilliant in the history of skiing. The Austrian appeared to be racing not on snow but on rails as he flew down the course, comfortably edging out his great rival, the Swiss Bernhard Russi. Despite his acknowledged reputation as the giant of downhill skiing, Klammer was never able to quite repeat his stunning form at Innsbruck, partly perhaps because of a knee injury. It was no real surprise, therefore, when he was left out of the Austrian side for the Lake Placid Games in 1980. Klammer was down but not out, and after months of hard training he was back to his very best, winning the downhill World Cup title for the fifth time in 1983. His final downhill triumph - he won 25 in all - came at Kitzbuhel in 1985 and he finally retired at the end of the season to concentrate on his sports equipment collection and his sports complex in Colorado in the US. Later Klammer returned to his native Carinthia where he became part of a team promoting the region and in 1998 he founded a society to help struggling athletes with psychological or financial difficulties. He also acted as spokesman for the organising committee responsible for Klagenfurt's candidacy to host the 2006 Winter Olympics before Turin got the nod.